“Too fast, too soon…” is what I was thinking as I let those 5 hammerheads ride away from me on Vista del Mar, heading north along the beach, with jets roaring above us taking off from LAX. Mark, Andy, Mark, Lloyd and Chuck seemed to be trying to punish each other, and we weren’t even 10 miles into a hot, 80+ mile day. I haven’t been riding hard enough or long enough lately to make that sort of effort, so I just backed off and kept thinking that excuse, uhh…tactic, yes tactic is better. If I go too fast too soon, I’ll hurt at the end. Lots of miles left in this ride, and it’s not getting any cooler, so I’ll just hang back here with Mario and Louie. 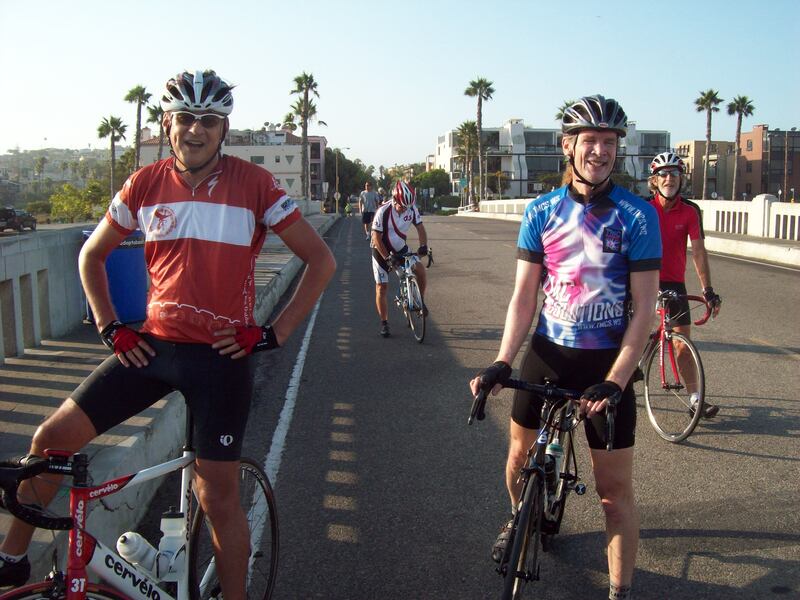 When the 3 of us reached the Ballona Creek bridge, the other 5 were waiting and expressing opinions about who was trying to go off the front and who was chasing down, a bit of trash talk. If it was me, I’d just say “the DS made me do it.” Not the devil, but the DS, although some pro racers might say the DS is the devil. So that’s how this day was going. Those 5 guys pushing each other, while Mario, Louie and I just try to hang on and survive. Beyond Ballona Creek we headed north on surface streets through MDR, Venice and Santa Monica, then popped out onto PCH and started high speed pacelining on our way out to Malibu. We passed smaller groups and some of them climbed on the train. 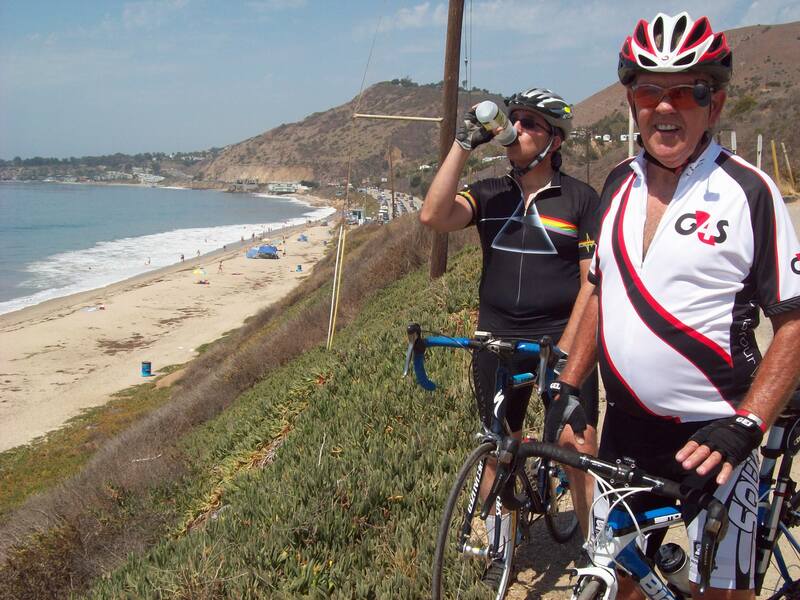 Up the first hill at Pepperdine University and into Michael Landon Park for a water break. 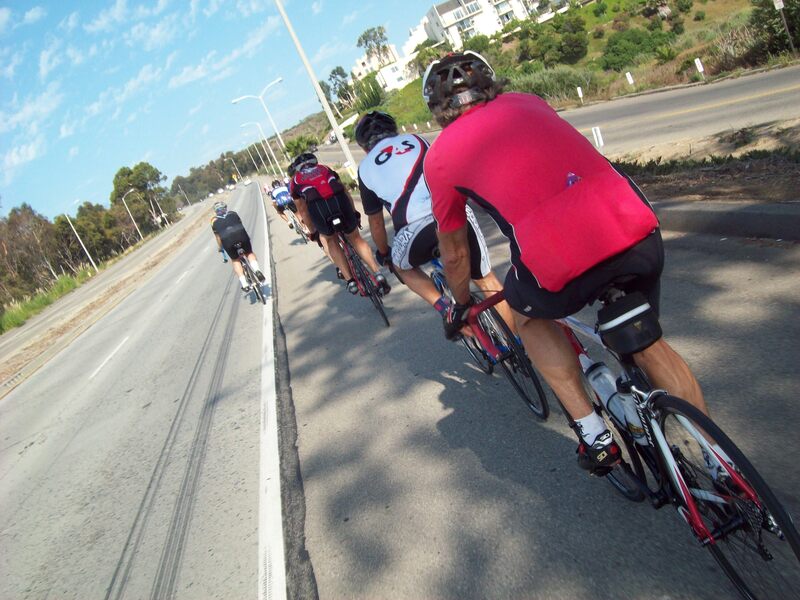 Back onto PCH heading for the base of Latigo Canyon, turn right, gear down and start climbing. I think the DS was ordering some of the guys to attack all the way up the climb because I didn’t see them again until the top. Again, I was hanging with Mario and Louie, trying not to over-exert my under-trained corpus. I have been up Latigo many times, this was quite probably my slowest ascent of them all. But frankly, I’m not caring a whole lot. As long as I enjoy the ride that is enough, and the uphill always means a downhill reward. The hammerheads wanted to do more climbing on Mulholland and the backside of Topanga, but Louie, Mario and I headed directly down Kanaan-Dume to PCH and back home. We weaved through the Saturday beach crowds all along the shores of Santa Monica Bay, back to the start at Catalina Coffee in Redondo Beach, where we stopped to service our calorie debt. Personally, after 80+ miles in the heat, with the climbing and the pacelining, I was nearly knackered. Good thing I ignored the DS. 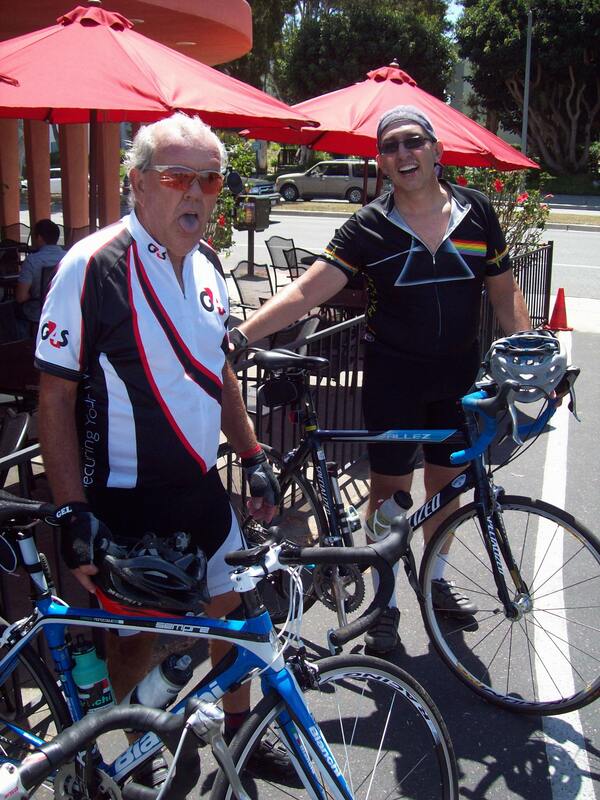 This entry was posted in Beach Cities Cycling Club, cycling. Bookmark the permalink. why is louie’s tongue blue? Oxygen debt? Reflection from the bike frame? Skittles as energy food?